The chapel has an aisle lined with three glass panels, so the couple and guests can enjoy views of the water below. Sandals is offering an exciting new way to exchange vows in the Caribbean. 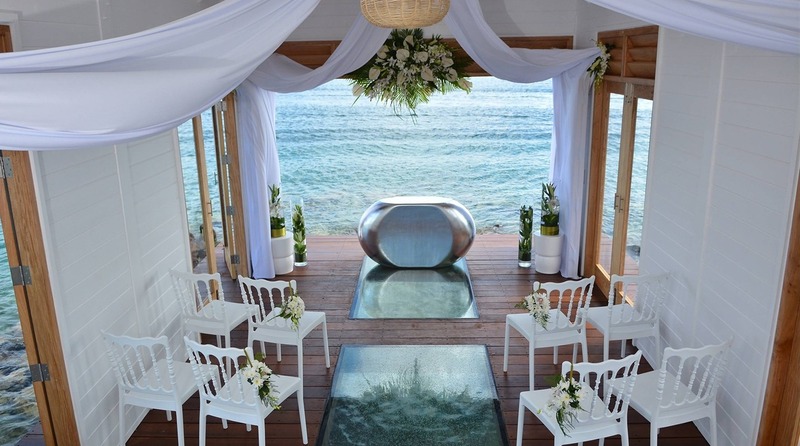 The company known for romance has a new overwater wedding chapel at its Sandals Grande St. Lucian resort. The chapel has an aisle lined with three glass panels, so the couple and guests can enjoy views of the water below. In addition, the overwater chapel has an open air design, allowing for panoramic views of Rodney Bay. A river stone alter polished with silver leaf finish adds more elegance to the nature-inspired ceremony. Sandals’ overwater wedding chapel can host up to 20 seated guests, and can be reserved complimentary upon arrival on a first-choice basis. Couples have the choice of having either a religious or non-religious ceremony.